Tag Archive | "gilbert kahele"
The Senate Committee on Water, Land and Housing (WLH) Chair Senator Donovan M. Dela Cruz and Vice Chair Senator Malama Solomon in partnership with Senator Gilbert Kahele are hosting the Department of Land and Natural Resources’ (DLNR) Hawai‘i Island Listening Sessions on Friday, November 4 and Saturday, November 5, 2011. 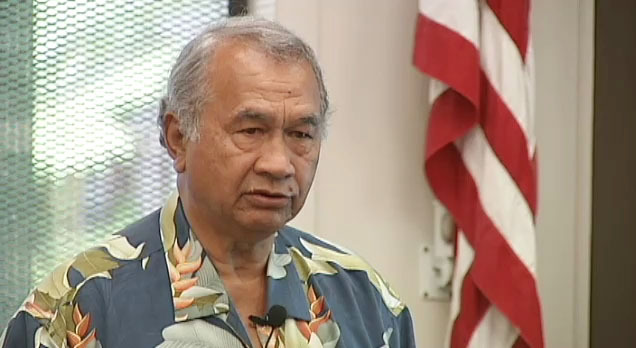 Governor Neil Abercrombie today announced the appointment of Gilbert Kahele to represent Senate District 2. Kahele fills the seat left vacant by Department of Agriculture Interim Director Russell Kokubun. Senate District 2 includes Waiakea Uka, Kalapana, Volcano, and Kahuku on Hawaii Island.